The Chicago area is filled with great places to take the family sledding. When life gives you snow, go sledding—after you dig out the car, that is. 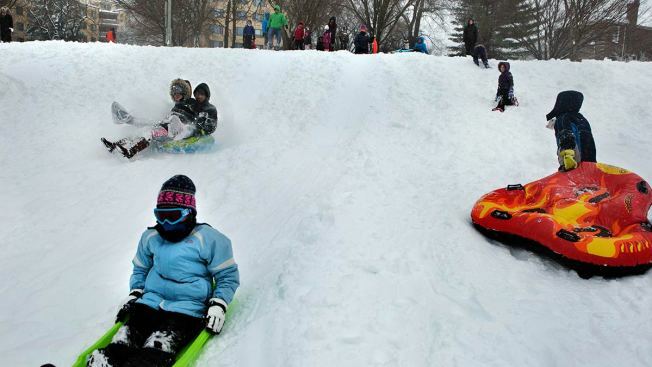 These 10 Chicago area sledding destinations will give you and the whole family a fun reprieve from the snow. Palmisano Park: This Bridgeport park, which began life as Stearns Quarry in the 1800s, is open 6 a.m. to 11 p.m. daily. Caldwell Woods: This far Northwest Side sledding destination is lighted and staffed 10 a.m. to 9 p.m. daily. A. Montgomery Ward Park: Located right along the river in River North, A. Montgomery Ward Park is flanked by coffee shops and restaurants. It is open 6 a.m. to 11 p.m. daily. Dan Ryan Woods: Like Caldwell Woods, Dan Ryan Woods, located in Ashburn, is staffed and lighted 10 a.m. to 9 a.m. daily. Warren Park: West Ridge’s Warren Park not only has sledding, but ice skating as well. It is open 6 a.m. to 11 p.m. daily, while the Chicago Blackhawks Ice Rink closes 9 p.m. most days. Oz Park: Located smack in the middle of Lincoln Park, Oz Park is surrounded by good eats and warm drinks. It is open 6 a.m. to 11 p.m. daily. Nickoll Knoll: Providing a great view of the Chicago skyline from the top of the hill, Nickoll Knoll in Arlington Heights is a great spot to dash through the snow. Emricson Park: This park, open 5 a.m. to 11 p.m. daily, is on Woodstock’s West Side and has the William C. Donato Conservation Area right across the street. Meineke Hill: Should you get too cold sledding at Schaumburg’s Meineke Hill, you can go warm up at the Meineke Recreation Center. Meineke Hill’s hours are 7 a.m. to 11 p.m. daily, while the recreation center is open 5:30 a.m. to 10 p.m. Monday through Friday and 6 a.m. to 10 p.m. on weekends. What are your favorite places to sled in the Chicago area?